We offer this class privately, customized to your needs. Let us help you accelerate your progress! Email us for details at info at soapshed.com, or fill out our Contact Us form to ask about scheduling this workshop. 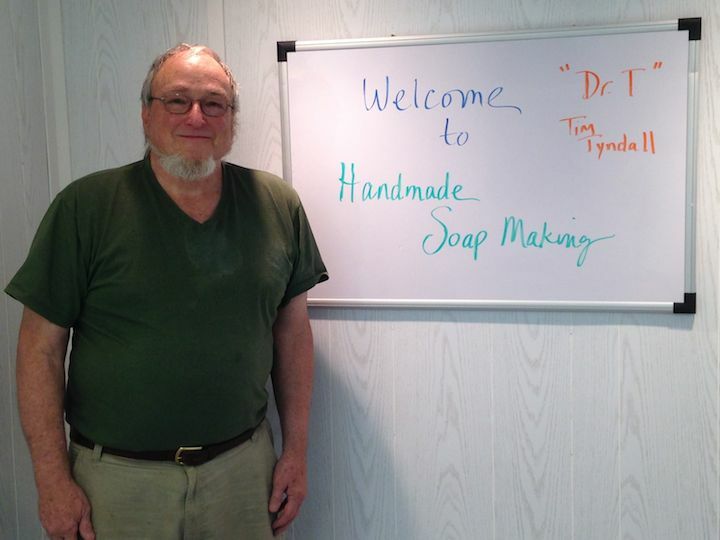 Are you considering moving from hobby to business level soapmaking production? So - the lure of handcrafted soap has you firmly in its grip! You and your family are hooked on that creamy, fresh lather and your skin feels so wonderful after each use. Your friends and extended family are always hounding you to make more and asking when you are going to start selling at the local craft mall or on Etsy? You really do like the feel and creativity of making soap but have only made a few bars at a time. What do you need to know to move to the next level? Is it simply doubling or tripling the size of your batches or something far more involved? What procedures are needed to move to a business model rather than remain in the hobby class? Do you need a license? How do you make the switch? If any of this “rings true,” then our 'Next Level' workshop may be just what you are looking for. Or maybe you’ve already made up your mind. You’ve been making soap for a while now and are confident in the process. Various opportunities for local sales through craft malls, farmer’s markets, church bazaars, and the festival circuit have confirmed there is a market for your products. By now your routines are pretty well fixed but you are stretched because your production per “batch” is so limited. It just seems you are making soap all the time and ordering more raw material every week. Moving to a new level just seems to be the best way. Yet, how do you convert from “kitchen” production to a more efficient and realistic routine for your demand? What is involved in “stepping off the deep end?” When is it 'time' to make it official, and say I AM in business and need to act accordingly? If this tension is part of your current reality, then our ‘Next Level’ workshop may be just right for you. This two day workshop will help you transition to the next level of soap production and make needed business adjustments when moving from just a few bars of soap per month to regular and significant production year round. Participation in this workshop will help you assess a complex of key indicators which are integral to the next level, and make the decision to move in an expanded direction - OR NOT. Without an awareness and understanding of what lies ahead you are vulnerable to frustration at the least and outright failure at the worst. A real result can be significant negative financial impact as well as a setback to growth plans in general. If you have considered “Upleveling” your business but are unsure what that might be like, then this is the workshop to answer your scariest questions and boost your confidence in taking your dreams to the next level. This workshop will lead you through the key components of expansion from production to the identification of new markets and product delivery. • What is the status of your current soap operation? : production, number of products, regular inventory, storage options, current market, sales, delivery methods, etc. • Where do you think you want to go with your soapmaking, and why? • What is the next best up-level for you? • How to decide? Do I just do it, or move gradually into it? • Testing the waters and making the “GO/NO GO” decision? Product preparation and packaging: labeling, inventory, delivery options: wholesale, on-site retail, off-site retail, internet sales via web store or “Etsy”. • When do I know I have made the turn successfully? What does the “bottom line” really look like, financially AND functionally. • Are there personal costs beyond just numbers? The workshop fee includes class time from 9:30am through 4:30pm each day; lunch, beverages and snacks; all supplies and materials needed for class and the Workshop Workbook including classroom lecture notes, helpful online resources, and recommended soap making suppliers. A tour of Soap Shed production areas, soap molds, drying racks, cutting, packaging, retail customer shop, and shipping areas will be provided over the two days. The ‘classroom’ part of each workshop day is over about 4:30 pm. Please Note:We do not teach ‘melt and pour’ glycerine soapcrafting or hot process soap in this workshop. We have successfully made and sold cold process soap for 20 years and that is the expertise we offer. Since this is not a hands-on soapmaking workshop, you may dress as you choose - casual and comfortable is always best! Consider the season and check the weather forecast before you travel here for class: The Blue Ridge Mountains can get very hot & humid during the Summer, and extremely cold during the Winter months. We offer this class privately, customized to your needs. Let us help you accelerate your progress! Email us for details at info at soapshed.com, or fill out the Contact Us form. Register for this Workshop by putting it in your shopping cart and checking out. You may also pay by check or money order in the amount of $165.00 and mailing it to The Soap Shed, 179 Meadow View Road, Spruce Pine, NC 28777. Our workshops are planned for small groups of 4-6 participants, and often require us to turn away additional participants when the workshops fill.